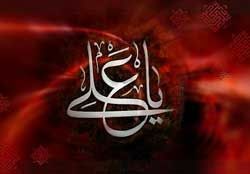 Imam Ali was the cousin of our Holy Prophet. He was born in the Sacred House (Ka'bah). Providence alone had a hand in bringing his mother towards the Ka'bah. When his mother came to Ka'bah, she felt weighed down by intense pain of pregnancy. She knelt down before the Holy Structure and prayed humbly to God. 'Abbas ibn 'Abd al-Muttalib, saw 'Ali's mother praying to God. No sooner had she raised her head from supplication, then the wall of the Sacred House split by a solemn miracle. Fatimah entered the Ka'bah and that portion returned to its normal position. 'Abbas and his companions flocked at the gate of the Sacred House which was locked, and tried to open it, but in vain. They then decided to give it up, considering the miraculous nature of the event and the Divine Will in action. The news of this miraculous incident soon spread like wild fire in Mecca. 'Ali was born within the Ka'bah with his eyes closed and his body in humble prostration before the Almighty. Fatimah stayed in the Ka'bah for three days and as the fourth day approached she stepped out, carrying her gem in her arms. To her great surprise, she found the Holy Prophet awaiting to receive the newly-born child in his anxious arms. Imamate feeling the subtle touch of prophethood, 'Ali opened his eyes and saluted the Divine Prophet: "as-Salamu 'alayka ya Rasula'lldh" (Peace be on you, O Messenger of Allah). 'Ali's birth in the Ka'bah is unique in the history of the world. Neither a prophet nor a Divine saint was ever blessed with such an honour. He was brought up under the care and affection of the Holy Prophet. As 'Ali says: "The Holy Prophet brought me up in his own arms and fed me with his own morsel. I followed him wherever he went like a baby-camel following its mother. Each day a new aspect of his character would beam out of his noble person and I would accept it and follow it as a command. " (Nahju 'I-balaghah). Ten years in the company of the Holy Prophet had kept him so close and inseparable, that he was one with him in character, knowledge, self-sacrifice, forbearance, bravery, kindness, generosity, oratory and eloquence. From his very infancy, he prostrated before God along with the Holy Prophet. As he himself said: "I was the first to pray to God along with the Holy Prophet." " 'Ali presented in the footsteps of the Holy Prophet," says al-Mas'udi, "all along his childhood." Allah created him pure and holy and kept him steadfast on the right path. Though 'Ali is undisputably the first to embrace Islam when the Holy Prophet called upon his listeners to do so, yet by the very fact that since his infancy he was brought up by the Holy Prophet and followed him in every action and deed including prostration before Allah, he can be said to be born a Muslim, just like the Holy Prophet himself. 'Ali, at all times, accompanied the Holy Prophet to help and protect him from his enemies. He used to write down the verses of the Holy Qur'an and discuss them with the Prophet as soon as they were revealed by the Holy Messenger, the Gabriel. He was so closely associated with the Holy Prophet that as soon as a verse was revealed to him during the day or night, 'Ali was the first to hear it. The Holy Prophet has said of 'Ali: O 'Ali, you are my brother in this world as well as in the Hereafter. I am the city of knowledge and 'Ali is the gate. Nobody knows 'Ali except Allah and I. Nobody know me except Allah and 'Ali. If you want to see the knowledge of Adam, the piety of Noah, the devotion of Abraham, the awe of Moses, and the service and abstinence of Christ, look at the bright face of Ali. When the Holy Prophet reached Yathrib (Medina) and met his followers who had come from Mecca at his call, he immediately appointed for each such followers a person from the people of Yathrib known as Ansar (Helpers), who had accepted his prophethood, to be a brother to him. His appointment of brothers was a great act of help for the refugees known as Muhajirun (Emigrants), who left their home and come to Yathrib. He made brothers of people who followed the same trade so that the Muhajirun could be usefully employed immediately. While the Prophet was appointing an Ansar a brother to a Muhajirun 'Ali who was present there, was not appointed as a brother to any Ansar. On being questioned as to why he had not appointed a brother for 'All, the Prophet said: "He shall be a brother to me." The character and calibre of 'Al; as judged by al- Mas'udi is, "If the glorious name of being the first Muslim, a comrade of the Prophet in exile, his faithful companion in the struggle for faith, his intimate associate in life, and his kinsman; if a true knowledge of the spirit of his teachings and of the Book; if self-abnegation and practice of justice; if honesty, purity, and love of truth; if a knowledge of law and science, constitute a claim to pre-eminence, then all must regard 'Al'i as the foremost Muslim. We shall search in vain to find, either among his predecessors (save one) or among his successors, those attributes. " Gibbon says: "The birth, the alliance, the character of 'Ali which exalted him above the rest of his country- men, might justify his claim to the vacant throne of Arabia. The son of Abu Talib was in his own right the chief of Banu Hashim and the hereditary prince or guardian of the city and the Ka'bah." " 'AIi had the qualifications of a poet, a soldier, and a saint; his wisdom still breathes in a collection of moral and religious sayings; and every antagonist, in the combats of the tongue or of the sword, was subdued by his eloquence and valour. From the first hour of his mission to the last rites of his funeral, the Apostle was never forsaken by a generous friend, whom he delighted to name his brother, his vicegerent, and the faithful Aaron of a second Moses." Under Divine instruction, the Apostle of Allah married his beloved daughter Fatimah to 'Al;, though others vainly tried for her hand. Among their children, Imam Hasan, Imam Husayn, Zaynab and Umm Kulthum have left their marks on the history of the world. After the death of Hadrat Fatimah, 'Ali married Ummu 'I-Banin. 'Abbas was born out of this wedlock and was so handsome that he was fondly called Qamar Banu Hashim. He personified loyalty and bravery and proved it in the battlefield at Karbala'. In the 40th year of Hijrah, in the small hours of the morning of 19th Ramadan, 'Ali was struck with a poisoned sword by a Kharijite while offering his prayers in the mosque of Kufah. (See photo on p. 56) The Lion of God, the most brave-hearted and fentle Muslim that ever lived began his glorious life with devotion to Allah and His Apostle and ended it in the service of Islam. The previous discussions lead us to the conclusion that in Islam, after the death of the Holy Prophet, there has continuously existed and will continue to exist with- in the Islamic community (ummah), an Imam (a leader chosen by God). Numerous prophetic hadlths have been transmitted in Sh;'ism concerning the description of the Imams, their number, the fact that they are all of the Quraysh and of the Household of the Prophet, and the fact that the promised Mahdi; is among them and the last of them. Also, there are definitive words of the Prophet concerning the Imamate of 'Al; and his being the first Imam and also definitive utterances of the Prophet and 'Al; concerning the Imamate of the Second Imam. In the same way the Imams before have left definitive statements concerning the Imamate of those who were to come after them. According to these utterances contained in Twelve- lmam Shi'ite sources the Imams are twelve in number and their holy names are as follows: ( I ) 'Ali ibn Ab; Talib; (2) al-Hasan ibn 'Ali; (3) al-Husayn ibn 'Ali; (4) 'Ali ibn al-Husayn; (5) Muhammad ibn 'Ali;(6) Ja'far ibn Muhammad; (7) Musa ibn Ja'far; (8) 'Ali ibn Musa; (9) Muhammad ibn 'Ali; (10) 'Ali ibn Muhammad; (11) al-Hasan ibn 'Ali; and (12) the Mahdi. Amir al-Mu'minin, 'Ali (upon whom be peace) was the son of Abu Talib, the Shaykh of the Banu Hashim. Abu Talib was the uncle and guardian of the Holy Prophet and the person who had brought the Prophet to his house and raised him like his own son. After the Prophet was chosen for his prophetic mission. Abu Talib continued to support him and repelled from him the evil that came from the infidels among the Arabs and especially the Quraysh. According to well-known traditional accounts 'Ali was born ten years before the commencement of the prophetic mission of the Prophet. When six years old, as a result of femine in and around Mecca, he was requested by the Prophet to leave his father's house and come to the house of his cousin, the Prophet. There he was placed directly under the guardianship and custody of the Holy Prophet. A few years later, when the Prophet was endowed with the Divine Gift of prophecy and for the first time received the Divine Revelation in the cave of Hira', as he left the cave to return to town and his own house he met 'Ali on the way. He told him what had happened and 'Ali accepted the new faith. Again in a gathering when the Holy Prophet had brought his relatives together and invited them to accept his religion, he said the first person to accept his call would be his vicegerent and inheritor and deputy. The only person to rise from his place and accept the faith was 'Ali and the Prophet accepted his declaration of faith. Therefore, 'Ali was the first man in Islam to accept the faith and is the first among the followers of the Prophet to have never worshipped other than the One God. 'Ali was always in the company of the Prophet until the Prophet emigrated from Mecca to Medina. On the night of the emigration to Medina (Hijrah) when the infidels had surrounded the house of the Prophet and were determined to invade the house at the end of the night and cut him to pieces while he was in bed. 'Ali slept in place of the Prophet while the Prophet left the house and set out for Medina. After the departure of the Prophet, according to his wish 'Ali gave back to the people the trusts and charges that they had left with the Prophet. Then he went to Medina with }:is mother, the daughter of the Prophet, and two other women. In Medina also 'Ali was constantly in the company of the Prophet in private and in public. The Prophet gave Fatimah, his sole, beloved daughter from Khadijah, to 'Ali as his wife and when the Prophet was creating bonds of brotherhood among his companions, he selected 'Ali as his brother. 'Ali was present in all the wars in which the Prophet participated, except the battle of Tabuk when he was ordered to stay in Medina in place of the Prophet. He did not retreat in any battle nor did he turn his face away from any enemy. He never disobeyed the Prophet, so that the Prophet said: " 'Ali is never separated from the Truth nor the Truth from 'Ali." On the day of the death of the Prophet, 'Ali was thirty- three years old. Although he was foremost in religious virtues and the most outstanding among the companions of the Prophet, he was pushed aside from the caliphate on the claim that he was too young and that he had many enemies among the people because of the blood of the polytheists he had spilled in the wars fought alongside the Prophet. Therefore, 'Ali was almost completely cut off from public affairs. He retreated to his house where he began to train competent individuals in the Divine sciences and in this way he passed the twenty-five years of the caliphate of the first three caliphs who (came to power after the Prophet; the first by election of few Muslims; the second appointed by the first; and the third, chosen out of six unequal candidates nominated by the second caliph. . .?!). When the third caliph was killed, people gave their allegiance to him and he was chosen as Caliph. During his caliphate of nearly four years and nine months, 'Ali followed, exactly, the way of the Prophet and gave his caliphate the form of a spiritual movement and renewal and began many different types of reforms. Naturally, these reforms were against the interests of certain parties that sought their own benefit. As a result, a group of the companions (foremost among whom were Talhah and Zubayr, who also gained the support of 'A'ishah, and especially Mu'awiyah) made a pretext of the death of the third caliph to raise their heads in opposition and began to revolt and rebel against 'Ali. In order to quell the civil strife and sedition, 'Ali fought successfully aware near Basrah known as the "Battle of the Camel," against Talhah and az-Zubayr in which 'A'ishah, "the Mother of the Faithful," was also involved. He fought another war against Mu'awiyah on the border of Iraq and Syria which lasted for a year and a half and is famous as the "Battle of Siffin". He also fought the Khawarij at Nahrawan, in a battle known as the "Battle of Nahrawan". Therefore, most of the days of 'Ali's caliphate were spent in overcoming internal opposition. Finally, in the morning of the l9th Ramadan in the year 40 AH, while praying in the mosque of Kufah, he was wounded by one of the Khawarij and died as a martyr during the night of the 21st. According to the testimony of friend and foe alike, 'Ali had no shortcomings from the point of view of human perfection. And in the Islamic virtues he was a perfect example of the upbringing and training given by the Holy Prophet. The discussions that have taken place concerning his personality and the books written on this subject by Shi`tes, Sunnis and members of other religions, as well as the simply curious outside any distinct religious bodies, are hardly equaled in the case of any other personality in history. In science and knowledge 'Ali was the most learned of the companions of the Prophet, and of Muslims in general. In his learned discourses he was the first in Islam to open the door for logical demonstration and proof and to discuss the "divine science" or metaphysics (ma'arif-e Ilahiyyah). He spoke concerning the esoteric aspect of the Qur'an and devised Arabic grammar in order to preserve the Qur'an form of expression. He was the most eloquent Arab in speech (as has been mentioned in the first part of this book). The courage of 'Ah was proverbial. In all the wars in which he participated during the lifetime of the Holy Prophet, and also afterward, he never displayed fear or anxiety. Although in many battles such as those of Uhud, Hunayn, Khaybar and Khandaq, the aides to the Prophet and the Muslim army trembled in fear or dispersed and fled, he never turned back to the enemy. Never did a warrior or soldier engage 'Ali in battle and come out of it alive. Yet, with full chivalry he would never slay a weak enemy nor pursue those who fled. He would not engage in surprise attacks or in turning streams of water upon the enemy. It has been definitely established historically that in the Battle of Khaybar in the attack against the fort he reached the ring of the door and with sudden motion tore off the door and cast it away. Also, on the day when Mecca was conquered the Prophet ordered the idols to be broken. The idol "Hubal" was the largest idol in Mecca, a giant stone statue placed on the top of the Ka'bah. Following the command of the Holy Prophet, 'Ali placed his feet on the Prophet's shoulders, climbed to the top of the Ka'bah, pulled "Hubal" from its place and cast it down. 'Ali was also without equal in religious asceticism and the worship of God. In answer to some who had complained of 'Ali's anger toward them, the Holy Prophet said: "Do not reproach 'Ali for he is in a state of Divine ecstasy and bewilderment." Abu'd-Darda', one of the companions, one day saw the body of 'Ali in one of the palm plantations of Medina lying on the ground as stiff as wood. He went to 'Ali's house to inform his noble wife, the daughter of the Prophet, and to express his condolences. The daughter of the Prophet said: " My cousin ('Ali) has not died. Rather, in fear of God he has fainted. This condition overcomes him often." The name, title and kunyat of a person can indicate his character like a mirror. In the Hadith and Tradition Books, Imam Ali (Pbuh)'s titles are about 250. Some of them were granted to him by the Prophet (P.B.U.H), such as: Commander of the Believers, Vassi (Legatee), Vali (Guardian), Abu Torab. A German author (Rodluf Jaiger) has a book named "Master of Knowledge and Sword" which includes a list of all various services by Imam Ali (Pbuh) in different feilds such as Scientific, Economic and Social. *Foundation of a Post-Office between Medina and the center of Arabs and Iranians' Battle. *Foundation of a Judical Organization. *Foundation of the most careful and regular Finance Ministry. *Construction of a port for Saudi Arabia (Jeddah Port and its jetty). *Construction of the first Islamic School in Saffeh. *Collection of the Holy Quran. *Teaching the reciting of the Quran. This Book is a collection of speeches, sermons and letters of Imam Ali (Pbuh). Nahj-ul-Balaqih as a valuable book shines in the sky of knowledge and art forever. If we think in Nah-jul-Balaqih's contents we will find more facts about Imam Ali (Pbuh)'s ideology in different parts such as theology, government, justice, prayer,epic, bravery and behavior. 4. He was the first to offer his services for Jihad. 14. He was the first to have the honor of being nominated by the Holy Prophet (PBUH&HF) as his succesor, testator and vice regent. 1. God gave Adam the knowledge of His names, while Ali held the entire knowledge of the Book of Allah. 3. God styled Noah as a "Grateful Creature" and he was called the Second Adam, while Imam Ali (as) was styled as "Abu'l Ummah"
One who develops the trait of greediness and avarice invites degradation; one who keeps on advertising his poverty and ill-luck will always be humiliated; one who has no control over his tongue will often have to face embarrassment and discomfort. When few blessings come your way, do not drive them away through thanklessness. Surrender and acceptance to the Will of Allah are the best companions; wisdom is the noblest heritage; theoretical and practical knowledge are the best marks of distinction; deep thinking will present the clearest picture of every problem. One who takes account of his shortcomings will always gain by it; one who is unmindful of them will always suffer. One who is afraid of the Day of Judgment is safe from the wrath of Allah; one who takes lessons from the happenings of life obtains vision, one who acquires vision becomes wise, and one who attains wisdom achieves knowledge. Treat people in such a way and live amongst them in such a manner that if you die they weep over you, and if you are alive they crave your company. If you get an opportunity and power over your enemy, then, in thankfulness to Allah for this: forgive him. He is very unfortunate who cannot in his lifetime gain even a few sincere friends and sympathizers and even more unfortunate is the one who has gained them and lost them (through his deeds). Failures are often results of timidity and fears; disappointments are the results of uncalled for modesty; hours of leisure pass away like summer clouds, therefore, do not waste the opportunity to do good. Whose deeds lower him, his pedigree cannot elevate. Be generous but not extravagant, be frugal but not miserly. To give up inordinate desires is the best kind of wealth and fortune. Often your utterances and the expressions of your face reveal the secrets of your hidden thoughts. Happy is the man who always kept the afterlife in his view, who remembers the Day of Reckoning through his deeds, who led a contented life and who was happy with the lot that Allah hath destined for him. Adversities often bring your good qualities to the front. Success is the result of foresight and resolution, foresight depends upon deep thinking and planning, and the most important factor of planning is to keep your secrets to yourself. Hearts of people are like wild birds, they attach themselves to those who love and train them. Only he can forgive who has power to punish. If you help a deserving person without his request then it is generosity and if you help him after his request then mostly it is due to shyness to your refusal or fear of reproach. There is no greater wealth than wisdom, no greater poverty than ignorance, no greater heritage than culture and no greater helpmate than consultation. Wealth converts every foreign country into your native place, and poverty turns your native place into a strange land. Contentment is the capital which will never come to an end. Wealth is the fountainhead of inordinate cravings. Whoever warns you against sins and vices is like the one who is carrying news of salvation to you. To lose friends is to become a stranger in one's own country. Not to have a thing is less humiliating than to beg it of others. Do not be ashamed if the amount of charity is small because to return the needy empty-handed is an act of greater shame. If you cannot get things as much as you desire, then be contented with what you have. An uneducated man or a savage will always overdo a thing or neglect to do it properly. Every breath you take is a step forward towards death. Anything which can be counted or reckoned is finite and will come to an end. If you are confused about good or bad effects of an action, then study carefully the cause and you will know what the effects will be. The value of each man depends upon the art and skill which he has attained. I appreciate an old man's cautious opinion more than the valor of young men. How I wonder at a man who loses hope of salvation when the door of repentance is open for him. He is the wisest and the most knowing man who advises people not to lose hope and confidence in the Mercy of Allah and not to be too sure and over-confident of immunity from His wrath and punishment. Like your body, your mind also gets tired and fagged; in such case find educational diversions for it. That knowledge is very superficial which remains only on your tongue; the intrinsic merit and value of knowledge is that you act upon it. Whenever a tradition of the holy Prophet (SAW) is related to you, examine it carefully and think over it deeply, do not be satisfied with mere verbatim repetition of the same, because there are many people who repeat the words containing knowledge, but there are few who ponder over them and try to fully grasp the meaning they convey. Those who give up religion to better their circumstances in life seldom succeed. The wrath of Allah makes them go through more calamities and losses than the gains they gather for themselves. There are many educated people who have ruined their future on account of their ignorance of religion. Their knowledge did not prove of any avail to them. Only such a person can establish the Divine Rule, who, where justice and equity are required, will neither feel deficient nor weak and who is not greedy and avaricious. When a community is composed of really honest, sober and virtuous people then your forming a bad opinion about any one of its members when nothing wicked has been seen of him is a great injustice to him; on the contrary, in a corrupt society, to form a good opinion of anyone out of those people and to trust him is doing harm to yourself. To lose or to waste an opportunity will result in grief and sorrow. What difference is there between a deed whose pleasure passes away leaving behind it the pangs of pain and punishment and the deed whose cruel severity or oppressive harshness comes to an end leaving behind it heavenly rewards and blessings. Blessings are the man who humbles himself before Allah, whose sources of income are honest, whose intentions are always honorable, whose character is noble, whose habits are sober, who gives away in the name and in the cause of Allah the wealth which is lying surplus with him, who controls his tongue from vicious and useless talk, who abstains from oppression and tyranny, who cheerfully and faithfully follows the traditions of the Holy Prophet (SAW) and who keeps himself away from innovation in religion. Whoever is not diligent in his work will suffer sorrow and loss; whoever has no share of Allah in his wealth and in his life then there is no place for him in the realm of Allah. If you understand the majesty of the Lord then you will not attach any importance to the universe and its marvels. An angel announces daily: "The birth of more human beings means so many more will die; the collection of more wealth means so much more will be destroyed; the erection of more buildings means so many more ruins in time to come." A friend cannot be considered as a friend unless he is tested on three occasions: in time of need, behind your back, and after your death. This world is not a place of permanent settlement, it is a passage, a road on which you are passing; there are two kinds of people here, one is the kinds who have sold their souls to eternal damnation. The other is of those who have purchased their souls and freed them from damnation. Daily prayers are the best medium to advance oneself in favor of the Lord. Haj is a Jehad (Holy War) for every weak person. For everything that you own, there is Zakaat, a tax paid to the Lord, and the tax of your health is that you keep fast. The best Jehad of a woman against men is to render his home life-pleasing and congenial. If you want to pray to the Lord for better means of subsistence then first give something in charity. Sorrow will make you half as decrepit as old age. Many persons get nothing out of their fasts but hunger and thirst; many more get nothing out of their night prayers but exertions and sleepless nights. Wise and sagacious persons are praiseworthy even if they do not fast and sleep during the nights. Remember that there are three kinds of people, one kind is of those learned people who are highly versed in the ethics of truth and philosophy of religion, second is the kind of those who are acquiring the above knowledge, and the third is that class of people who are uneducated. They follow every pretender and accept every slogan, they have neither acquired any knowledge nor have they secured the support of firm and rational convictions. Remember Kumail, Knowledge is better than and superior to wealth because it protects you and you have to guard wealth because wealth decreases if you keep on spending it and knowledge increases the more you make use of it; and because what you get through wealth disappears as soon as wealth disappears. One who adopts patience will never be deprived of success though the success may take a long time to reach him. One who assents or subscribes to the actions of a group or a party is as good as if he has committed the deed himself. A man who joins a sinful deed makes himself responsible for two-fold punishments; one for doing the deed and the other for assenting and subscribing to it. One who guards his secrets has complete control over his affairs. Oppression and tyranny are the worst companions for hereafter. There is enough light for one who wants to see. Often the inordinate desire to secure a single gain acts as a hindrance for the quest of many profitable pursuits. People often hate those things which they do not know or cannot understand. One who seeks advices learns to recognize mistakes. One who fights for the cause of Allah secures victory over his enemies. When you feel afraid or nervous to do a thing then do it, because the real harm which you may thus receive is less poignant than its expectation and fear. Your supremacy over others is in proportion to the extent of your knowledge and wisdom. The best way to punish an evil-doer is to reward handsomely the good deeds of a good person. Obstinacy and stubbornness will not allow you to arrive at a correct decision. Deficiency will result in shame and sorrow, but caution and foresight will bring peace and security. To keep silent when you can say something wise and useful is as bad as to keep on propagating foolish and unwise thoughts. If two opposite theories are propagated, one will be wrong. One who starts tyranny will repent soon. One who cannot benefit by patience will die of grief and excitement. If you find that somebody is not grateful for all that you have done for him then do not get disappointed because often you will find that someone else feels under your obligation though you have done nothing for him and thus your good deeds will be compensated, and Allah will reward you for your goodness. Hearts (minds) have the tendencies of likes and dislikes, and are liable to be energetic and lethargic, therefore, make them work when they are energetic and on subjects which they like. The destitute is the messenger of Allah. Whoever denies him denies Allah and whoever gives him gives Allah. Avarice is disgrace; cowardice is a defect; poverty often disables an intelligent man from arguing his case; a poor man is a stranger in his own town; misfortune and helplessness are calamities; patience is a kind of bravery; to sever attachments with the wicked world is the greatest wealth; piety is the best weapon of defense. He who is greedy is disgraced; he who discloses his hardship will always be humiliated. The sin that makes you sad and repentant is more liked by Allah than the good deed which turns you arrogant. Today, there have been 10 visitors (27 hits) on this page! Fasting of Ramazan was prescribed on muslims, 2 A.H. The Birth of the Imam Hussain (AS), 4 A.H. The Birth of the Maula Abbas (AS), 26 A.H. The Birth of the Imam Ali ibn Al-Hussain (AS), 38 A.H.
2.The first coins were made in Islam, 75 A.H.
3.The day of minor occultation of Imam Mahdi (ATF), 260 A.H. The grat flood in Makkeh destroyed parts of Kaaba, 1039 A.H. The Birth of the Imam-e-Asr ibn Al-Hasan Al-Askari (AS), 255 A.H. The battle of Bani Almustalegh with moshrekeen, 6 A.H.
Fasting became obligatory for Ramadan, 2 A.H. Copyright © 2006-2013 smfaizhaider. All rights reserved.